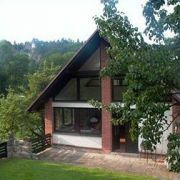 Accommodation in a picturesque village near the Kost Castle in the Czech Paradise. Walking, tours, hiking, biking … More » . Castles, nature. Recently classical stylish villa from the 1930s that has been restored recently offers 2 apartments for 2-6 persons with its own kitchen and bathroom with a shower. Spacious and light house that was originally used as an art studio with area of 107m2. 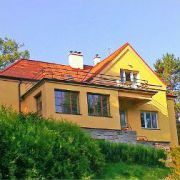 The house is situated in … More » the centre of Mala Skala on the bank of the Jizera River. We offer two fully equipped apartments (6 beds + 10-14 beds) in village Malá Skála in the heart of the Bohemian … More » Paradise. 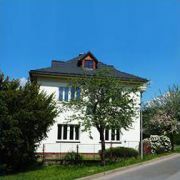 The house can be rented as a whole but also the apartments can separately booked. Both apartments provide high comfort accommodation with own kitchen, bathroom and Internet.